Incense has a special significance in spiritual life in many Asian countries, including Vietnam. Burning incense is part of Vietnamese culture and beliefs. 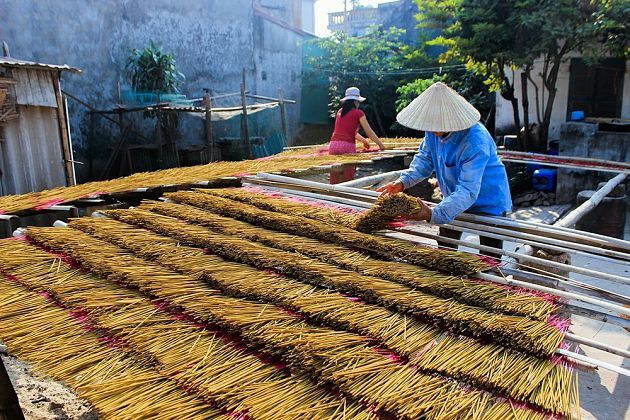 In today’s edition of Vietnam in close up, Hanoi Local Tour will give you three traditional incense craft village to find out how incense sticks are made. Yen Phu is one of Thang Long’s traditional handicraft villages, placed in the center of Hanoi, on the west bank of Tay Ho district. The village is known for making incense that has existed for a long time, experiencing ups and downs with the capital’s thousand-year history. The village is located at Yen Phu estuary, Tay Ho district, Hanoi city. People in the village have a job of making incense for a long time. According to the elders in the village, the village’s incense making career originated from a Chinese tradition from the 13th century and developed to this day. Buddhism and the burning of incense develop here and many other places. 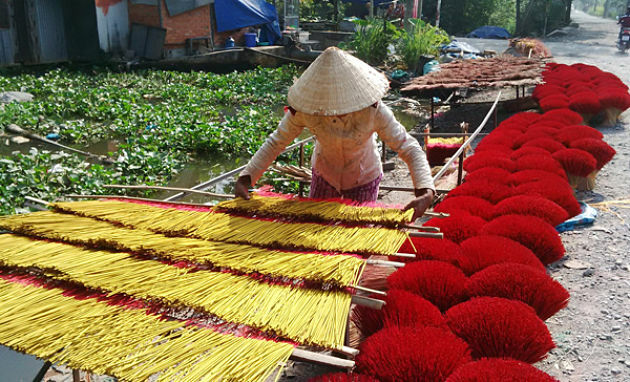 Entering this century, the profession of incense in Yen Phu is the most developed and not only attracts people in the village but also attracts An Duong and Nghi Tam villages with a large number of jobs. At the beginning of the 80s, incense jobs were no longer popular when many families quit their jobs and moved to farm ornamental fish and trading and trading. At this time, only about 20% of households in the village still work. However, only 7-8 years later, entering the 90s, making incense was restored. The job is quite hard and the income is not so high, but the people still follow a job because they think that this is a traditional job, and for a long time, the people who have lived by this profession now do not know how to change jobs. 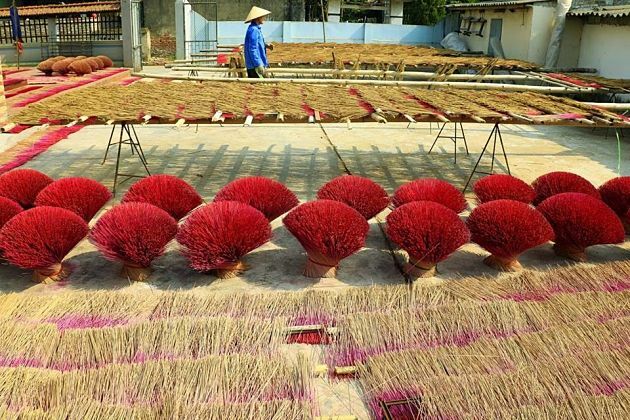 Located about 42 km to the east of Hanoi, Xa Kieu village in Ung Hoa district is famous for incense. No one knows exactly when the craft began but elderly people in the village said that when they were only about 6-7 years old, they saw their parents chopping bamboo rods to make incense sticks. Making incense is an efficient process in which no materials are wasted. Nowadays, most of the steps are performed by machines. However, some villagers remain faithful to manual techniques. Xa Kieu villagers have had a chance to showcase their products at the Vietnam Traditional Craft Village Tourism Festival 2016. The craft provides a decent income for Xa Kieu’s villagers, who are kept busy from early morning until late afternoon. From November through March is the best season for selling incense. Xa Kieu’s products are also shipped to nearby provinces such as Thanh Hoa, Nam Dinh, Hai Duong, and many southern provinces. In particular, in the current economic context, the craft villages are falling into a difficult situation, the deadlock of output, the carts carrying bamboo sticks here and there are still crowded out every day. This entry was posted in Hanoi Tourist Attractions - Best Places to Visit in Hanoi, Hanoi Travel Blog - Hanoi Introduction & Information. Bookmark the permalink.